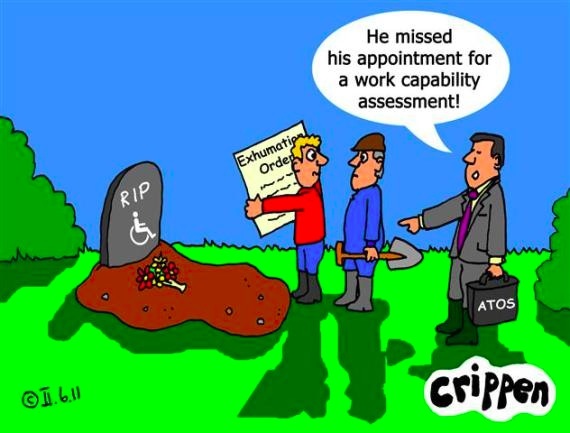 Over the past week or so I’ve been working on helping get a memorial event together to mark the devastating impact of the Work Capability Assessment on the disabled community. Sometimes awareness of adversity can bring together the most unlikely bedfellows. I’m not sure who made the first move but campaigners from Occupy London - famous for camping outside St. Paul’s, have been meeting with Michael Meacher MP and the Cathedral’s Dean - The Reverend Dr David Ison - to organise a ceremony of remembrance and solidarity for those who have had their lives devastated by the austerity programme, including more than 10,000 people who died within six weeks of undergoing the Atos Work Capability Assessment between January and November 2011. These figures were released by the DWP. Up-to-date figures have not been released under the freedom of information act. I’m pleased to say I’ve been able to muster a few disabled poets and performers to take part at the 10,000 Cuts and Rising event in Parliament Square and help us to raise awareness. Graeae’s Reason’s to be Cheerful star John Kelly will MC on the day and the enigmatic Sophie Partridge has agreed to read a testimony from the ATOS Stories. DAOs own rhyming rapper Bonk and the irresistible Penny Pepper have also agreed to perform in a spot after the handing into Parliament of the War on Welfare (WOW) Petition which calls an end to the Work Capability Assessment. If you haven’t signed yet, then please do so by clicking here – as we are hoping to get the number of signatures up to 100,000. In a recent meeting Michael Meacher told us that he had received over 2,000 unsolicited emails from people telling their tales of discrimination at the hands of Atos and the WCA. On the day there will be a 2 minute silence to remember those who’ve died, after some reflective ‘prayers’ from the Dean, calling for a new deal for disabled people. The Press have largely been pretty unhelpful in recent years, but one or two journalists have raised their heads above the wall of misinformation to counter the lies. Ros Wynne-Jones has written an article in the Daily Mirror today about the background to the event which is to happen in Parliament Square on the 28th September from 12am onwards. Lastly I’d urge you to look at Liz Crow’s InActualFact website of bite-sized, but well-researched facts. Tweet them. FaceBook them. Counter the misinformation, which has allowed the terrible state of affairs to go unnoticed.